One of Barbados' natural resources is clay and the pottery industry has a 350 year history with several designs being unique to the island such as the monkey jug and coneree. Several modern potteries have evolved making fabulous tableware. The traditional Barbadian potters are located in the hilltops of Chalky Mount in the Scotland District, which is where the clay is found. 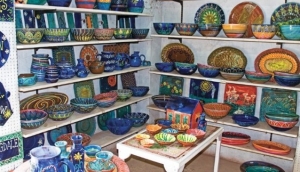 Of this rich heritage of pottery in Barbados modern potteries have evolved such as Earthworks Pottery, Fairfield Pottery and the Pottery Place, more conveniently located near to the west coast.